With his sharp-witted illustrations and insightful one-liners, the French illustrator, painter and writer Jean-Philippe Delhomme (born 1959) is a deft observer and loving critic of our contemporary culture. 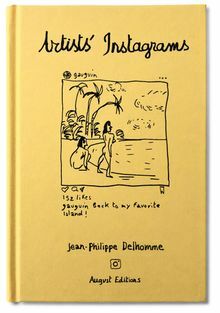 In his latest book, Artists' Instagrams, Delhomme imagines what the masters of modern art would have posted if they had access to Instagram and shared our addiction to the platform. Artists' Instagrams: The Never Seen Instagrams of the Greatest Artists is one of the first art books to engage Instagram’s influence in our visual culture (Kim Kardashian’s pioneering efforts notwithstanding). 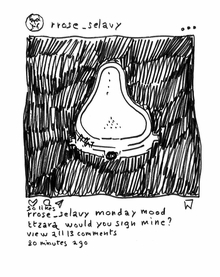 But Artists’ Instagrams is not only an amusing mash-up of high culture and everyone's favorite social media platform; it's a veritable history of modern art through hashtags. Hardcover, 5 x 7.5 in. / 176 pgs / 85 bw. 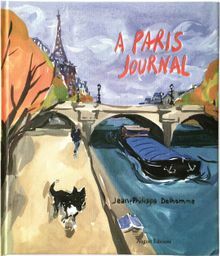 In 2015 the French illustrator and writer Jean-Philippe Delhomme was asked by Zeit Magazin, the Sunday magazine of the German newspaper Zeit, to contribute a weekly column for the year about living in Paris. 2015 was an extraordinary and tumultuous year for Paris, with the Charlie Hebdo and the Bataclan terrorist attacks in January and November, which Delhomme covered with sensitivity and poignance. In between, he wrote about and illustrated the daily joys and frustrations of living in one of the world's most beloved cities, from daily walks with his dog Astor to discover Picasso's former studios, to the invasions of Uber and joggers in the Luxembourg gardens. As Delhomme writes in his Introduction, "Paris, lost in its winter rains and dim light, is a trip through time. From its greyness, I came to realize, there were many stories to emerge if you had, maybe, the eyes of a dog to see them. The night recalls Brassaï, the hunching silhouette of Giacometti blurs in the winter fog, and Gertrude Stein's exhausted guests wait for a cab on rue de Fleurus, next to a contemporary princess commanding an Uber from her iPhone." Hardcover, 9.5 x 11 in. / 160 pgs / 60 color.